For Ben Hill, walking across the finish line was one of the proudest moments of his life. Crossing the finish line at an event like the Medibank Melbourne Marathon Festival is always a huge achievement. For Ben Hill, the moment was particularly special. Last year, he walked the last 350 m around the MCG on his own, without the use of his wheelchair – something he never imagined was possible. And he’s all set to do it again this October. Ben has an acquired brain injury that limits his use of his lower body, and he was expected to never walk again. Then he met Neville Stone, a volunteer from Scope disability support services, who suggested getting involved in some physical activity. With the help of his mum Mary, Ben shares his story. In July 2015, I met Neville Stone, a Scope volunteer. After hearing me passionately talk about the footy, Neville thought it would be great if I started doing sports myself. He suggested that I participate in the Medibank Melbourne Marathon Festival in my powered chair and I reluctantly agreed. On the first morning we trained, it was windy and I was irritated. We only got 100 m to the letter box when I told Neville that I wanted to go back. Neville thought that he had bitten off a bit more than he could chew but he continued to train with me every Friday morning. After a while I started to enjoy myself and to go harder. lt was good to meet people walking, cycling and walking their dogs. We began to recognise each other and say "Hi". In October 2015, Neville and I did the Melbourne Marathon 10km event with my friend Emma. I crossed the finish line, controlling my chair by myself for the last 30 m.
Then I set myself a goal – to walk around the MCG in 2016. We trained for months around the local park and worked with my physiotherapist so I could develop the stamina to walk the final lap. Neville and I also spoke to people from Scope Bendigo about my marathon journey, and they got excited and decided to join too, with lots of them doing the 3 km. Then Channel 7 News heard about my story and interviewed me. I was thrilled to watch myself on TV and was even more determined to achieve my goals. On the day of the race, I was calm and ready. Dad, Neville, Emma, Matt (her husband and my best mate), their kids Jasper and Jemima, Rob J. (ARA) and James Anderson (Scope) and others were with me but this time I controlled my chair all the way. When we finally got inside the ‘G’. Dad helped me to stand and together we walked the last 350 m together. The announcer kept calling out my name and the crowd roared. As I crossed the finish line on my own two feet, I felt so elated! Mum and Dad were crying and everyone’s cheers were deafening. Then the Channel 7 people interviewed me again and asked how I felt. I said, “I want to do it again next year." I enjoyed the TV coverage and learned how many hours of filming it takes for a 29 second segment on The Project! has improved heaps. I never imagined I would ever be able to be part of a marathon, but I have learnt you do not need to be an athlete to participate. All you need is passion, determination and good support. This year, I want more people to join me in the Melbourne Marathon and share the journey with me. 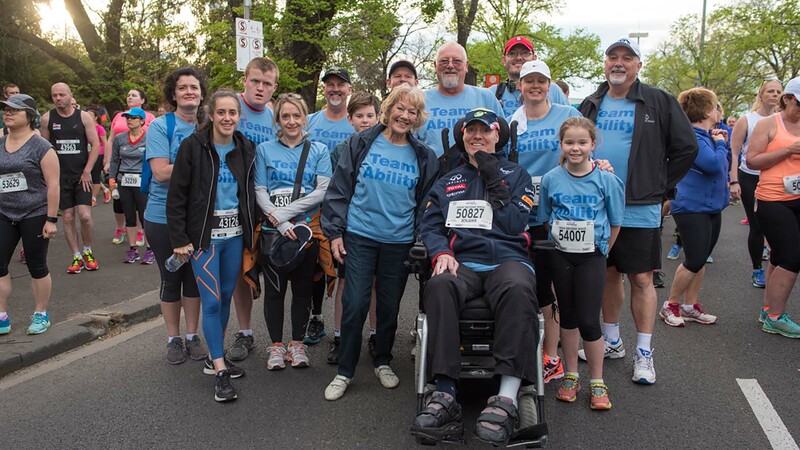 Learn more about Scope’s disability support services and join Ben's Medibank Melbourne Marathon Festival team.